If you joined us for today’s Google I/O 2018 Keynotes with Live Chat, first I want to say thank you. We figured we’d try the live, interactive chat and it really worked out well. Well enough, in fact, that we’ll definitely be doing much more of this type thing in the future. There’s a chance many of you rolled out after the first keynote without realizing there was a second, developer-focused keynote. In the first one, there was so much going on that we Chromies didn’t really have much to chat about. It was all AWESOME stuff that will impact the way we interact with all our devices, but some of the stuff our readers were waiting to hear more about simply didn’t get a mention. The second keynote, however, had a nice nod to Chromebooks and all we’ve been tracking in the past few months. As we expected, the term Crostini will begin to fade into the background over the next few months. 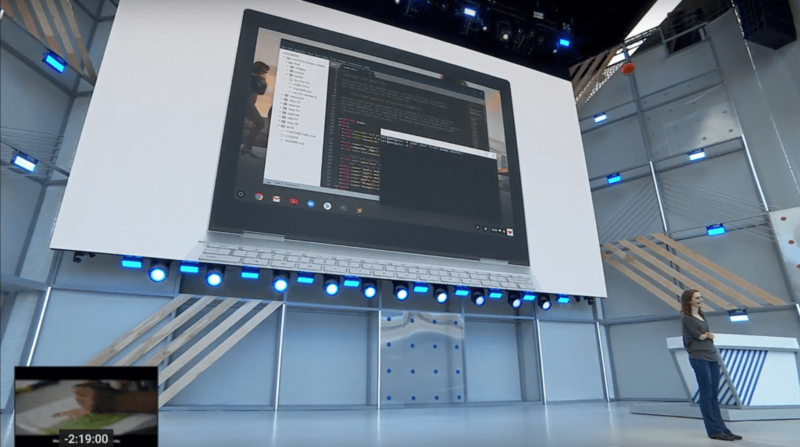 What people need to know is users will be able to run Linux apps on Chrome OS soon, and for Pixelbook owners in the Dev Channel, right now. None of this comes as a surprise if you’ve been reading and keeping up with all that has been going on in the Chrome OS world, but what happened today is very important, nonetheless. We’re expanding Chrome OS to support developers with the ability to securely run Linux apps on Chrome OS. Sure, there was a sentence or two more, but the mention was quick. Along with this nod, we also got a statistic that said Chromebooks have grown 50% over the past year in both units sold and 28-day users. We mostly knew this was coming, so why is it important? Because Google has now very publicly announced what it is doing with Crostini. No longer relegated just to tech blogs like this, the news that Linux apps will run on Chromebooks is now very real and very public. This means that Google will continue the feverish development around this initiative moving forward. Android apps took WAY too long to be fully realized and this initiative doesn’t need that. Now that it is public, Google will have to keep pushing to make it a full reality. And soon, you’ll even be able to run Android Studio on Chrome OS. Most likely this will come via Linux apps on Chromebooks, so this backs up the hope that all this will be fully-functioning very soon. We’ve been wondering how or if Google would make these apps available to general users via an app store of some sort, and I’m now uncertain that will happen. Perhaps the first steps are all developer-focused and certain apps will come later. Perhaps, as we saw MUCH more coverage about PWA’s (you can read more about them here) in the keynotes, this is where Google wants to keep the consumer attention moving forward. It makes sense: Chrome OS is a web-first platform. As the web grows into an open, strong platform for application delivery, Chrome OS stands at the ready to accept that future with open arms. I still hope that at least a few core apps will be made publicly available for the general user, but we’ll have to wait and see how this all plays out. For now, Linux apps on Chrome OS is official, and we’re excited to watch all the pieces come together.